Wilsey Ham has provided ongoing Professional Land Surveying services to Genentech, Inc., one of the Bay Area’s leaders in biotech research and development. These services have been provided over numerous years and several campuses from South San Francisco to Dixon, CA. 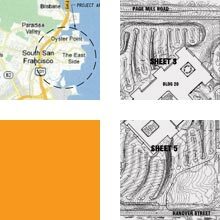 Silicon Valley’s founder–Hewlett Packard–employed Wilsey Ham to perform campus-wide mapping for their two extensive Bay Area campuses. The final mapping product was formatted to be compatible with HP’s GIS mapping database.